Set conditions en-masse or per selection. Ability to auto-select Favs, 2nd Favs, etc. Automated betting is one best things to happen this century, especially for those of us lucky to profit from horse racing and other sports. However most of these bots can be complex things to use, or they are just setup mainly for one type of betting, few programs actually do what the majority of punters do; simple betting with simple staking. I have used virtually all betting bots on the market over the years and most of them are crap. The one I use most in Betangel Pro, however it is setup more to the pro-trader, but can be used for auto-betting, but this can be a bit mind boggling for Joe Punter. Betsender is the only bot I have come across over the years that actually does the basics of placing bets automatically for you while you are off working, shopping with the missus, or out having a drink. It is a simple set and forget auto-betting bot, with a few extras thrown in that make it stand out from the crowd in a big way. The software includes around 20 staking plans you can use for Win or Lay bets, and will automatically calculate the next stake. You can set the time the betting bot strikes the bet or take BSP. All stats are kept per staking plan. One of the best features is the Simulation Mode, so you can test different systems/staking without the risk of it wiping out your betting bank. Selections can be add manually per selection, by using the search function and selecting multiple markets, or by importing a list via an Excel CSV file. For those without Microsoft's expensive Excel, the free Open Office will do the job. I've added Betsender CSV download files to each of the tips categories I supply, so following Win2Win is now even easier. If you are manually adding markets, either one at a time, or via the search function, you either select a named horse or 1st-6th unnamed Fav. You then set the conditions such as Min/Max price, either individually or globally. Once that is done you then select the staking plan. If you're not sure stick to either Levels or Percentage set at 3% to start with. The best software for running staking plans on past results is The Staking Machine, a must for any serious gambler. Once you have all the selections in place, and you can use it on all sports not just horse racing, it is just a case of clicking START BETTING and then go off and do whatever it is you need to do, free of having to sit around betting race by race or rushing to get them all on at lunchtime. What if you want to run multiple staking plans? Simple. You can fire up multiple instances of Betsender, so if you have 4 systems with different staking, load up the software 4 times. 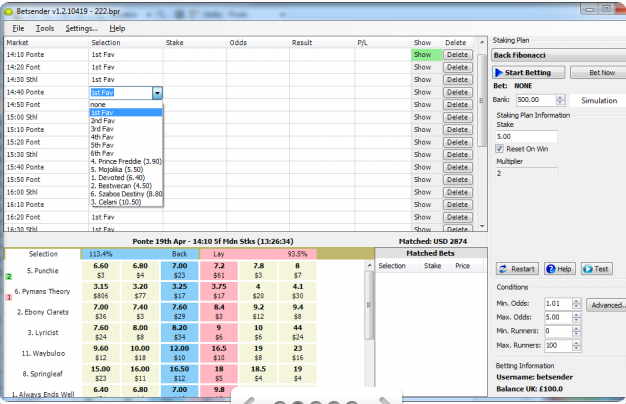 You can even have it log into different Betfair accounts as well, and fire an extra one up to test ideas in Simulation Mode. Each staking plan has different settings and can be easily changed. You can have the software stop-at-a-winner or a set profit/loss for it to stop at. 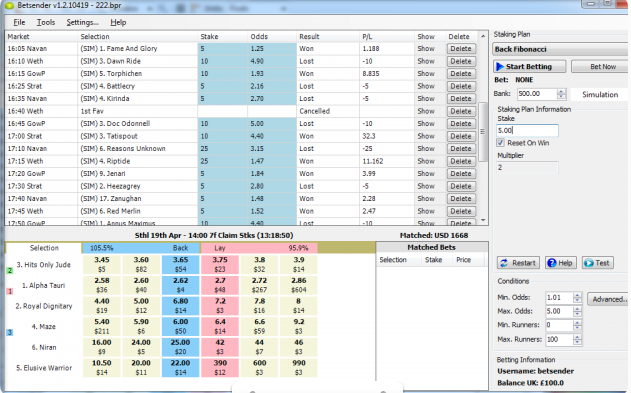 You can even have it bet less than the minimum Betfair stake, although I do not recommend this for long term betting. If you do have time to sit and watch a market and you see a good price for your selection you can hit the BET NOW button instead of waiting for the bot to make the bet. Betfair commission is included in P/L results. Support questions have been answered quickly, and plenty of help and videos are available. Download and save the Betsender CSV file from under the tipping box. In Betsender click Tools>Import. Make sure COMMA is ticked. In the FIELDS box make sure the first one is RACE NAME and the second is RUNNER NAME. If not just click the box and select. Then click OK. Simple as that! Once done, the list of horses will appear in Betsender. Just set the Max Price if you are doing Laying, or leave blank for Win bets. Select the staking plan, and click START BETTING. If you are following more than one batch of Win2Win Tips then load up another instance of Betsender and import them into that. I've used Betsender myself and it gets the thumbs up from me too. It was the one off payment that appealed to me most, great value. It's easy to use especially now that the W2W tips are already in the correct format. One improvement I would like to see would be the ability to place bets at a different price to what's on offer. For example, when laying, an order is placed at the back price rather than taking the available lay price which is what I would usually do if laying manually. Thanks for letting me know about this option, so thought i would take advantage of the trial using free bets before taking the plunge. Have downloaded Betsender, then tried to import selections as per instructions but when i press start i am getting a box telling me there were problems loading selections and it seems the time is an hour in advance on the bot, even though the imported sels. show the correct time and course. Forget that Keith, just unticked other boxes and loaded fine. Shame that this version doesn't work with Betdaq cos at the moment I'm laying at a £1. Simulating the Turbo Lays today and this would be ideal for me instead of me having to sit at my computer all day!!! On the subject of the Turbo Lays, I've done these for a week now, 2 days using the non-members list and the rest the full list and I am currently showing a profit of approx £75. Just read the software info above. Would I'd be able to stake to a £1 using this software? You certainly can. It is actually against Betfair's T&C, although as the software uses the API, they have a bit more give in the rules, as many bet below the £2 when greening up trades. Probably best not to do it too long though. Cheers, perhaps I might wait until my stakes reach £2. Do you know if any of the built-in staking plans replace the staking plan built into the System Banker Software? With a full monthly subscription to win2win Keith, do you get all the daily selections including Turbo Lays in the form of a Betsender csv file? I have been using Betsender for weeks and it is almost perfect. There are a few annoying things about it but all in all it's far and away the best way to place system bets. I export the results every day to csv files which is fantastic for geeks like me to analyse results and data. which bot to choose for automated betting?